On BC-Alberta boundary at NE side of Mount Assiniboine Provincial Park, NE of Golden, Kootenay Land District. This peak may be slightly on the Alberta side of the border. 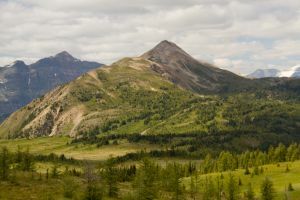 It is about 3.7 kilometres WNW of Citadel Peak, and just west of Sundown Lake on the Citadel Pass trail. Its prominence saddle is just SE of Black Rock Lake on a rise in the Citadel Pass Trail.